Matching the negotiating strategy to your type of negotiation will improve your bottom line and save you time. Is a collaborative negotiating strategy your best choice? Are you approaching all your negotiations with a standard strategy? Should you only use a win/win approach to negotiations? Is your present negotiating strategy your best option? Whilst I agree with the notion that a win/win approach is the only sustainable way to gain competitive advantage in the marketplace, it is well worth considering the practical application of this strategy in today's global marketplace. It would be short sighted to conclude that all negotiations are made equally and should therefore be approached using the same negotiating strategy. It would be similar to say that one nation's culture & beliefs are the appropriate culture and therefore the standards that apply to that culture should be applied in interacting with people across the world, irrespective of their background. There is another dimension within the context of negotiating strategies that should be considered - the old economic dilemma of 'guns or butter'. The 'guns or butter' story illustrates that with limited resources, organisations and individuals are forced to make choices. In order to have more butter, one must sacrifice guns and vice versa. In a practical sense, this means that resources can only be allocated in relation to the relative strategic importance of the activity at issue. In the case of negotiations that are considered strategic in importance to the organisation, we are more likely to pursue a collaborative or compromising approach. 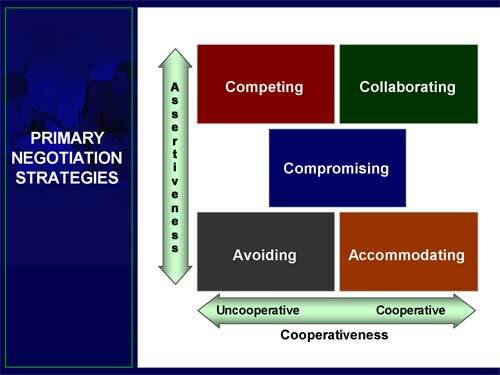 Conversely, when we deem the outcome of certain negotiations to have a limited impact or no impact at all on the achievement of strategic organisational objectives we could decide to be competitive in our strance even to avoid negotiation completely. We would not be responsible stewards of corporate resources if we'd used similar negotiating strategies to approach all negotiations. There is also a philosophical dimension to the approach to a negotiating strategy pursued by many organisations. Some organisations are renowned for their collaborative approach to doing business whilst others have a reputation for a mercenary approach to conducting business. Some players in the retail sector have reputations of dealing ruthlessly with suppliers - they rationalise the approach by arguing that it is in the interest of the consumer. Whilst I agree that this approach is short sighted and probably not sustainable in the long run, it would be naive not to recognise the fact that, at least commercially speaking, a lot of organisations have little interest in collaborative or compromising type negotiations within certain departments. It is interesting to note that whilst most organisations pride themselves on providing 'solutions' to the issues confronting their clients, a significant proportion of their so called negotiating strategy actually revolve around haggling about price. I have no doubt that there is a sincere intention to engage on a solution based principle it just seems that this is much easier said than done where the rubber hits the road. A lot of the time companies' stated intentions to engage on a win/win based principle is similar to the new year's resolutions so many of us make every year. There is scant chance of us achieving our resolutions without putting in place a supporting plan and taking action to achieve our goals. Many organisations lack a clear organisational negotiating strategy & process which exposes them to the risks associated with a huge variance in the results of their negotiated agreements. Organisations and individuals should recognise that collaborative negotiation demands the investment of significant resources. In order for us to be truly collaborative, we have to spend much time getting to know each other. In a commercial context, this plainly does not make sense in some cases. Consider the purchase of a pure commodity such as paper for a small or medium sized organisation - if there are no value added services presented or required, it would be sub optimal to pursue a collaborative relationship with the provider of such a commodity. It would make more sense to pursue a competitive approach to the procurement of paper than a collaborative or even compromising approach. In practise, many organisations would approach the purchase of paper or stationery in a way where they would request multiple quotations and award the business to the lowest bidder. As a matter of fact, in some cases no negotiation at all would take place. An interesting note here is that this does not mean that the paper supplier has lost as a result of this commercial transaction - they have won the order, but the telling thing is that we were not really interested in their interests at all: we were only focused on our desired objectives. So pursuing a win/lose negotiating strategy in this example has not really resulted in a loss for the supplier, but it does mean that we were not really interested in their desired outcomes. The flip side of this example is that if you are selling commodity type products, you have to realise that before you will be in a position to negotiate, you must create for yourself a base to do this from - hence the move towards providing solutions. Engaging in a competitive negotiation where we seek to achieve our goals aggressively. Engaging in an accommodating negotiation where we seek to satisfy only the needs of our counterparty to the exclusion of our own needs. Using a compromising approach where we seek to satisfy some of our needs and interests and some of the needs and interests of our counterparty. Deploying a collaborative negotiation approach where we seek to satisfy all our needs and interests in addition to satisfying all the needs and interests of our counterparty. How strong are my alternatives to this particular negotiation? How important is a long term relationship in the context of this commercial negotiation? It follows that in many cases, buyers would be pursuing a strategy where they are avoiding negotiation or being competitive and sellers would like to be compromising or collaborative. How then to deal with this situation? A key part of the negotiation preparation process should be focused on trying to understand your counterparties needs, interests and objectives. This will assist you in identifying the likely negotiating strategy that they will be pursuing. If your counterparty is avoiding a negotiation, you can be sure that your organisation is not being viewed as a contributor of competitive advantage to your counterparty's organisation. Your challenge would in the 1st instance be to reconsider the way that your products and services are packaged. The aim should be to add to the achievement of the strategic business objectives of your counterparty by identifying the components of your offering that matches their strategic needs. If you find yourself at the wrong end of a competitive negotiation, it would serve you well to be familiar with the most often used negotiating tactics as you will most certainly be confronted with a tactical approach. Unless you are well versed in negotiating tactics, it will be difficult for you to use your strategy and maximise the value that you will be able to extract from the negotiation as there is no sincere interest on the part of your counterparty to satisfy any of your needs or interests.